The driver of a van is injured as a van plunges from the 4th floor of a parking garage at Miami International Airport. 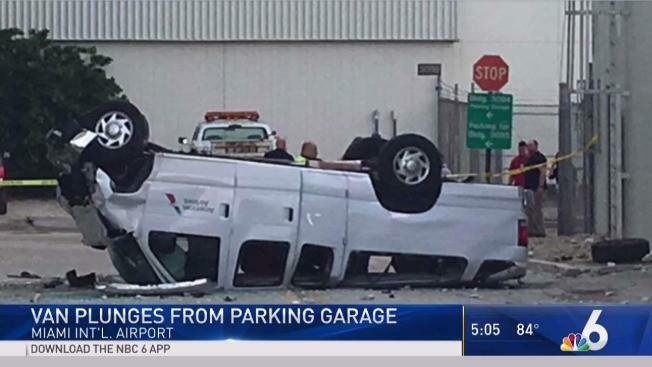 An American Airlines employee was injured Friday when the company van he was driving plunged from the fourth floor of a parking garage at Miami International Airport, authorities said. Miami-Dade police said the driver crashed the van through the fourth-floor wall and landed on its roof on the concrete below. The incident at the employee parking garage at the airport's maintenance hangar was reported just after 8:15 a.m., Miami Dade Fire Rescue said. The driver of the van, identified as 59-year-old Orlando Luna, was taken to a nearby hospital and is listed in good condition. He was the only person inside the vehicle. In a statement, American Airlines said the employee sustained minor injuries but was transported to the hospital as a precautionary measure. The incident remains under investigation but it's believed to be an accident.